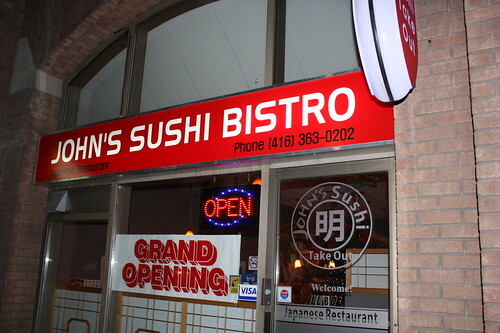 John’s Sushi Bistro is in the former spot of Akira Sushi on Front Street East, between Jarvis and Sherbourne. It’s a place you likely only know about if you live in the St. Lawrence Market neighbourhood due to its somewhat discreet location. The banner in the window screamed ‘Grand Opening’ even though they’d been open for a few months already. Please read our conversational review, below. Almost every Saturday morning on my trek to the St. Lawrence/Farmer’s Market I park across the street of this place. At first I noticed the Akira Sushi but what really caught my eye was when it was re-branded/new owners with the new name and colour. I must admit that “John’s Sushi Bistro” doesn’t really scream authentic Japanese sushi but then again, it did peak enough interest for us to give it a try. We met up on a Tuesday, at 5:30pm, and the place had only one other group there. I was warmly greeted right away and took a table by the window. 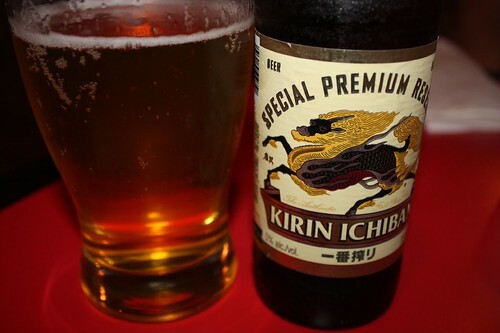 I asked what their beer list was (fairly extensive, actually) and ordered a Kirin Ichiban, one of two Japanese beers they serve. 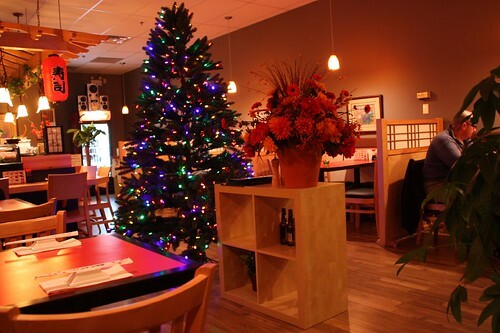 Oh, John’s Sushi Bistro had the Christmas tree all lit up as well! Ha yeah I love the early xmas decorations. Must be an asian thing or something because there are a few other restaurants that also have xmas trees and other decorations up just a bit on the early side. Still made me smile coming in though. I came a little bit after you and was greeted by the waitress and I assume John the sushi chef? Hehe… then who was Akira?—the old sushi chef? I wish I knew. I wonder if it’s the same guy! First thing I notice on the menu is that they have a lot of different types of rolls with all kinds of unique names. 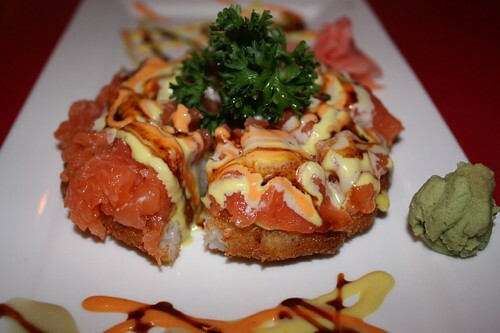 This is right up our alley as we always go for the crazy type of rolls. Akira – John: Same thing… I think. Yeah, their menu of maki is different from the regular choices. Right away I spot the Bulgogi Rolls: yep, that’s one of my choices. Reminds me of Gal’s Sushi up in Markham where you can get a sushi lunch special that includes some bulgogi on the side. 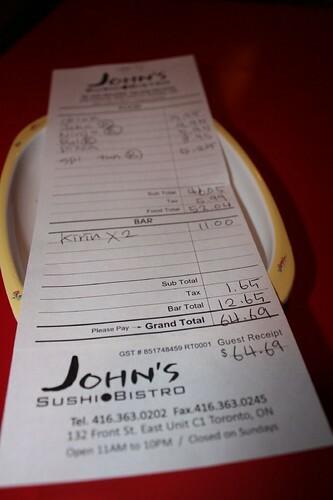 We also order up Spicy Tuna rolls, the Ninja roll and John’s Special roll (which costed a whopping $16!). Also, we ordered the Salmon Sushi Pizza. Since they are offering Bulgogi rolls, I am pretty sure this is one of the Korean based sushi restaurants. Not that there’s anything wrong with that but it’s obvious that in Toronto, it’s pretty hard to find an actual Japanese run sushi restaurant. At least not one that is more on the cheaper/budget category. Now I really have high expectations for this John’s Special rolls. Not only is it double the regular price but it’s also got his name on it! John’s Special rolls had a zillion things in it them, with sauce strewed overtop. My guess is that’s supposed to justify the price. I don’t recall all the items at the moment, but I thought it tasted pretty good. Definitely different from the norm. Now was it double-the-price-good? I’ll have to say no. I enjoyed them but you’re likely better off getting two rolls of something else for the price of one of John’s Special rolls. Credit to them to trying something different, but they have to work on the price point. Your not kidding about the sauce. Way too much sauce and different tastes thrown together. It’s like the kitchen sick of maki rolls. Just too much for me and maybe the price point made it a bit sour for me too. Not much of a “special”. The sushi pizza was okay but it seems they use some of the same sauce as John’s Special roll. Yeah, the Sushi Pizza was definitely saucy as well. John loves his sauce, I guess!? I thought it tasted decent, though. I have no complaints about the Sushi Pizza. Actually, I appreciate places that make theirs different from the typical ‘Yonge Street’ sushi pizza fare. But, yeah, their Sushi Pizza was teeming with ‘stuff’ on top. What else? The Bulgogi rolls I was happy with. Sure, different from the norm but tasty. Nice to see something different on the menu (I’m sounding like a broken record). The Bulgogi rolls were decent, I’ll give you that. The rest of the rolls were alright as well but nothing really outstanding. I was hoping for more out of the Ninja Roll just by the cool name, but it was more or less standard fare. I did notice that the place started to get more customers as the night went on though. As that started to happen, we got less and less visits from the waitress. I noticed your beer was done and my cup of green tea was empty. It was like this for way too long in my opinion until she finally came back to out table to check up on us. Yeah, service was great at the beginning, but once there was more than two tables of customers things went down hill – and fast. How am I supposed to eat the Spicy Tuna rolls w/o a bit of ‘refreshment’? I wasn’t impressed. It was, truly, a long wait too. So, about those Spicy Tuna rolls, nothing special. I agree with you about the Ninjas. Definitely not Ninja-like. Oh well I guess it’s a bit of a reflection on the quality of food as well. Not a winner for me on this one. The saving grace perhaps was the free mango ice cream dessert at the end. Love the little extras like that. 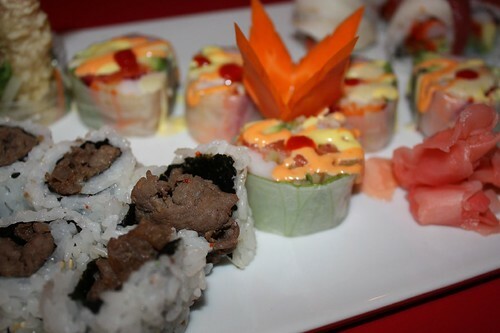 Overall, John’s Bistro Sushi was a miss for me. I was going to give it a 5.5 out of 10 but I’ll bump it up .5 for that free ice cream. 6 out of 10. Hehe… note to Toronto sushi restaurants: serve ice cream to get that extra 0.5. Yeah, I enjoyed the free ice cream. Ditto for the appetizer noodle soup that we seemed to not mention earlier in this review. The bill, without alcohol, was $52 (tax included). Add in two Japanese beers and it comes out around $65. This is a tough one for me. 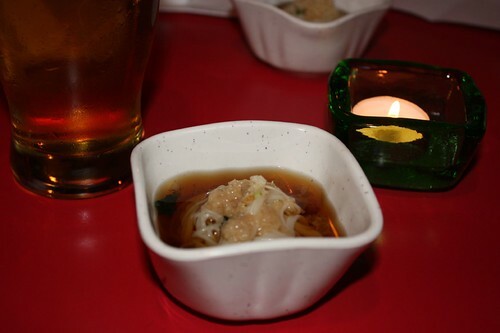 Things started off so promising – the ‘non-norm’ menu items, the Japanese beer, the good service at the beginning. Then a massively overpriced roll (which was overrated) and the lack of service heading out. But, free add-ons like the noodle soup and the mango ice cream. I’m going to steal your 5.5 and go with that. 5.5/10. Hit up Sakura Ichiban, about a 5 minute walk away, for a far better experience. Whoa stop the presses! I can’t believe that I actually rated this place slightly higher than you? I was expecting a 9/10 from you… lol. 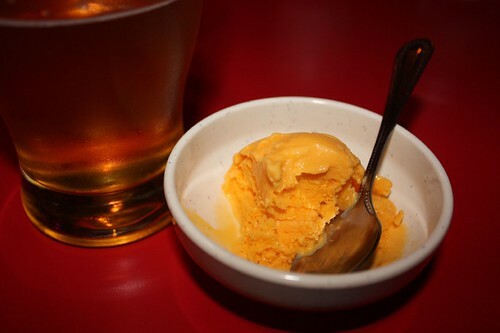 Oh well I am a sucker for mango ice cream. I usually order the Party Platter, but the value is amazing. 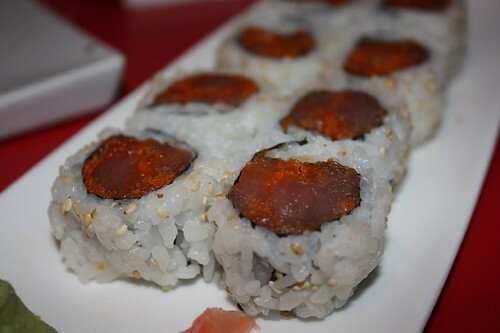 I love their spicy salmon and the crunchy tempura rolls, and our server is always friendly (the service CAN take a bit long, but we think nothing of waving her over with a smile). 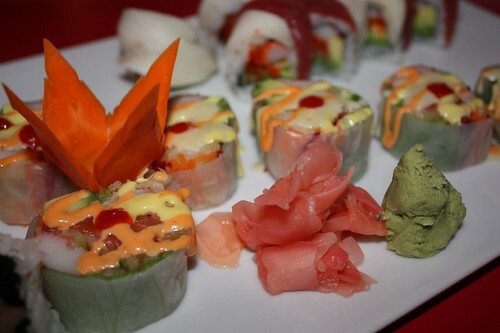 John’s Sushi Bistro is absolutely delicious. I have been to an array of sushi restaurants all over the city from Bikkuri to every sushi place on College Street (Sushi Sky, etc) and John’s Bistro is #1 in my opinion. Hiro’s is good too, but I like value for my food and his servings are small (but tasty). 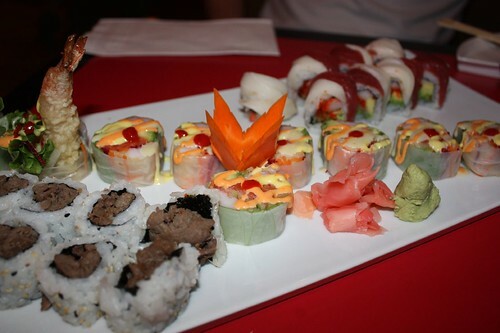 I would rate John’s Sushi Bistro a 9\10!